From what I’ve read, everything I’ll be eating in Ukraine will be very fresh — this is mostly due to the fact that much of the food is grown in-country, and there will be many farmers’ markets at which to buy fresh food daily. Staple crops include sugar beets, potatoes, grapes, cabbage, and mushrooms. Anyone who knows me well knows that I LOVE beets! Probably the first thing you think of when you think about Eastern European cuisine is…borscht (borshch, or борщ; above left)! This is kind of a blanket term in Ukraine for a soup made with many root vegetables (beets — YUM, carrots, potatoes…) and garnished with sour cream. Sometimes the soup vegetarian and sometimes meat is added. It’s often eaten with dark bread. Sauerkraut (kvashena kapusta, which I think literally means “pickled cabbage”) seems to be popular as well, either alone or in salads. They pickle a lot of things in Ukraine, probably because there’s a short-ish growing season. The Peace Corps information recommends that Volunteers learn to pickle/can/preserve foods for the winter — fun! According to Wikipedia, “breads and wheat products are very important to Ukrainian cuisine” — YES! They make various fancy breads for holidays such as Easter and Christmas. 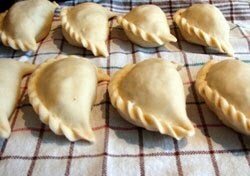 Along the main-course line, varenyky (варе ники; below) are pierogi-like dumplings that can be filled with almost anything: potatoes, onions, meat, cabbage, even cherries or strawberries. Served with sour cream (they love that stuff!). There seem to be many variations on the dumpling in Ukraine. Like much of Europe, Ukraine also has their version of potato pancakes in deruny (деруни). My Peace Corps readings tell me pork is the most commonly-eaten meat in Ukraine, though chicken is common as well. With all the sour cream it sounds like I’ll get plenty of protein in my diet! For dessert, Ukrainians eat various fried-dough and torte/cake variants, and jellied fruits. What do Ukrainians drink? Well, as you may guess, vodka (horilka, or горілка) is common. But I don’t have to drink it. Wine (vyno, or вино), beer (pyvo, or пиво) and mead (med, or мед) are also common alcoholic drinks. On the non-alcoholic side, there are a few types of sweet drinks made from dried fruit (kompot and uzvar) as well as dairy-based products such as kefir. I’m excited to embark on Ukrainian culinary adventures. I hope my PST host family will teach me how to make some of the traditional dishes. 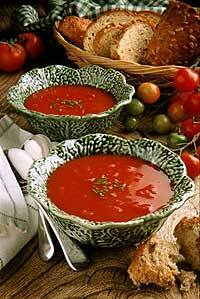 Apparently there’s a saying in Ukraine: “Ukrainian food is so good that we don’t need to add spices.” Awesome. Stay tuned for more on Ukrainian culture! This entry was posted in food on 24.07.2010 by taplatt.